Belleisle has a cafe and in the same buildings toilets which are accessible by all, not just for cafe users. Access by bus. Which buses stop here? There are a range of footpaths through the estate. Access to the Conservatory & Walled Garden from the north – tarmac, slightly uneven, some points with a greater than 1:12 incline and steps with handrail. 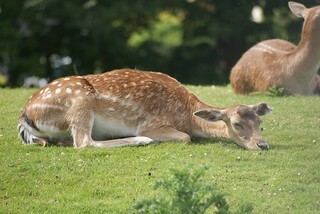 Belleisle also has a deer park which is home to a number of Fallow deer.